That's right! The dishes and the other chores can wait. Making memories with your children can't wait! One morning after breakfast, I went straight to doing the dishes and my daily routine of cleaning. Raylan looked at me with the saddest little voice and said "Mommy, Watch Handy Manny With Me!" That stopped me right in my tracks. He needed me. He wanted me to make time for him instead of those dishes. It hit me like a ton of bricks. I was spending more time trying to make my house look perfect instead of taking time for him and making memories with him. Needless to say, I immediately stopped doing those dishes and started watching Handy Manny with him. As moms, we get so caught up in all the things that we need to get done and often forget about the most important things in life. Our children are only little once. They grow up way too fast. We only have a short amount of time to make these memories, but a lifetime to clean the house. Now, I'm not saying to completely neglect your home because there are things that you absolutely have to get done, but stop trying to be a perfectionist. Our children are far more important than any chore. 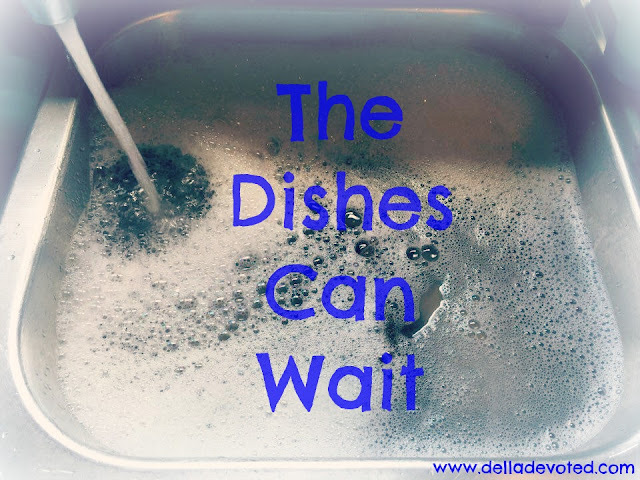 Take time out of your day to put their wants and needs above the housework. Stop and do something that your child wants to do. This will make them happy and you too. They just want your love and attention. Our attention shouldn't always be on the things that we want and need to do all the time. Take time to consider their feelings. Do something that will put a smile on their face! Get done what you need to get done, but don't spend all day doing chores when you could be making memories instead. Don't let your children grow up right in front of you while you're too busy trying to have the perfect home. Those dishes can wait, Childhood can't!